Beset by a scandal in which its former general manager allegedly stole thousands of pounds from the organization, the Radio Society of Great Britain (RSGB) has undertaken a major reorganization to try to stay afloat. At an "Extraordinary General Meeting" of the society on November 19, RSGB members voted overwhelmingly to adopt a reform committee proposal to temporarily replace the elected board of directors with an "interim board" made up of eight amateurs with significant business and financial expertise. According to the RSGB website, these directors will serve for 15 months, will take necessary actions to put the society back on a sound financial footing and make recommendations to the membership for future governance. At least two U.S. Senators have taken action to try to stop the FCC from granting approval for LightSquared to operate a wireless internet service on frequencies adjacent to those used for the Global Positioning System (GPS). Citing potential interference to the satellite direction-finding system "on which our public safety and national security depend so heavily," Kansas Republican Pat Roberts introduced an amendment to an approriations bill to prevent the FCC from using appropriated funds for approving LightSquared's application until interference concerns have been resolved, according to his website. In addition, various news sources reported that Senator Chuck Grassley (R-Iowa) threatened to block confirmation of President Obama's two nominees to the FCC unless the Commission released documents he requested related to LightSquared. The Senate was scheduled at the end of November to begin the confirmation process for the two nominees, Democrat Jessica Rosenworcel and Republican Ajit Pai. Ham radio operators provided varying levels of communications assistance in response to floods in Thailand and Italy, an earthquake in Turkey and a damaging snowstorm in the US Northeast in late October and early November. "Newsline" reports that the secretary of Thailand's national ham radio association says its members have saved nearly 1000 lives by coordinating rescue communications in the wake of the country's worst flooding in over 60 years. Hams also responded after a magnitude 7.2 earthquake struck eastern Turkey, to floods in Italy and a late October snowstorm that left huge swaths of the northeastern U.S. without power. 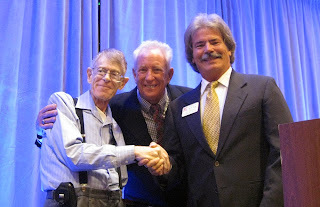 Mendelsohn with a Lifetime Achievement Award. CQ magazine honored Steve Mendelsohn, W2ML, with a Lifetime Achievement Award at the Pacificon hamfest in October. Mendelsohn, who is fighting pancreatic cancer, has been Communications Director of the New York City Marathon for more than 25 years and served the ARRL as First Vice President and as Hudson Division Director and Vice Director. He was also a leader in repeater coordination in the 1970s and 80s. Professionally, as an audio engineer at CBS and then ABC, Steve was press pool broadcast engineer for four presidents during foreign trips, and more recently in charge of all radio communications at Giants Stadium in New Jersey during New York Jets home games. CQ Ad Manager Chip Margelli, K7JA, presented Mendelsohn with a plaque during the Pacificon banquet. The FCC has made minor tweaks in its 2004 rules for Broadband over Power Lines (BPL), but adopted neither the changes proposed by the ARRL nor its own original proposal. In a Second Report and Order on the issue, which followed a 2008 federal court ruling that it had made procedural errors in the original proceeding, the FCC changed from 20 dB to 25 dB the amount by which BPL providers need to be able to notch their signals in the event of interference complaints. But it did not go along with the ARRL's request for mandatory notching of ham bands. BPL is a means of providing high-speed internet access to homes via power lines, using frequencies in the HF and low VHF portions of the spectrum. In test markets, certain types of BPL caused massive interference to close-in amateur stations. So far, the system has not proven to be economically feasible anywhere that it has been tried. The European Council of Post and Telecommunications Administrations (CEPT) has endorsed a proposal to create a worldwide secondary amateur radio allocation between 472 and 480 kHz. According to "Newsline," stations using the new allocation, if approved, would be limited to five watts effective radiated power (ERP). A ham allocation in the neighborhood of 500 kHz is expected to be taken up at January's World Radiocommuincation Conference in Geneva, Switzerland. For more on WRC-12, see "Washington Readout" in the January, 2012 issue of CQ. Ham Radio to Join Cast of "Last Man Standing"
Amateur radio will become an ongoing part of the ABC comedy, "Last Man Standing." Star Tim Allen will have various pieces of ham gear on his office desk, including rigs provided by ICOM, and an HF antenna from Comet. Scenes from CQ videos will be visible on his large-screen TV and some copies of CQ magazine may show up on his desk as well. His character will be identified as a licensed ham, although the callsign he will use is fictional. Last month, we reported that all donations made to the now-cancelled DX0DX expedition to the Spratly Islands would be refunded in full. This was not entirely accurate. 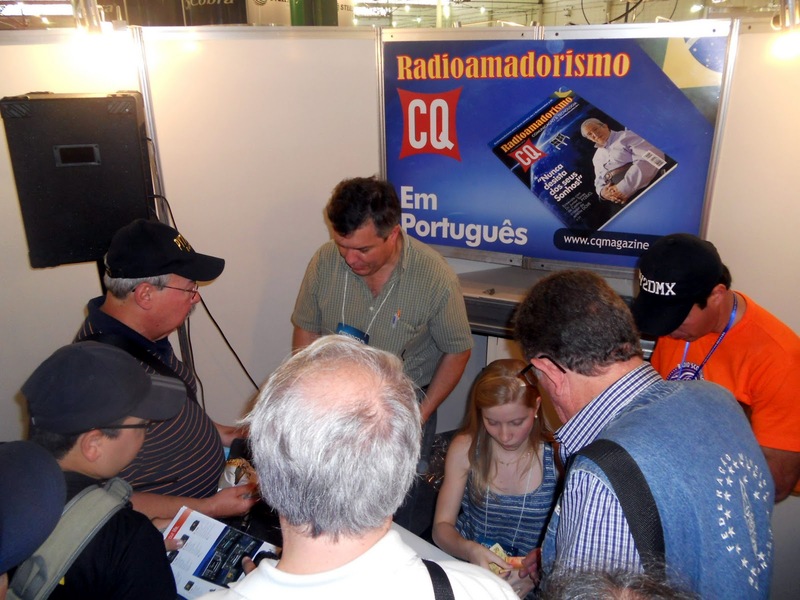 In an e-mail to CQ in response to questions raised by readers, team leader Chris Dimitrijevic, VK3FY, explained that "(t)he extremely high cost of this DXpedition will mean that the team will receive refunds that will amount to less than what was contributed." He said the plan was for all DX0DX assets to be sold, with the proceeds being disbursed as either partial or full refunds. Individual donors were to receive 100% refunds, he said, with club and foundation sponsors being reimbursed for 80% of their donations. The remaining funds were to be divided among team members to help reimburse their major investments in the planned trip, which was cancelled due to safety concerns. A several-month backlog of certificates for various CQ awards and the CQ DX Marathon has been completely cleared out. A variety of circumstances led to the backlog over the summer, but all pending certificates submitted through the end of October have been completed and mailed as of this writing in mid-November. We apologize for the delays. CQ Amateur Radio Hall of Fame member John Townsend, W3PRB, became a Silent Key in November. Townsend was one of NASA's early administrators, responsible for the acquisition and construction of the Goddard Space Flight Center in Greenbelt, Maryland. He was also a key negotiator of the first US-Soviet space treaty. Townsend left NASA for several years to help establish the National Oceanographic and Atmospheric Administration (NOAA) and to work in private industry. After the explosion of the shuttle Challenger in 1986, he returned to NASA as Deputy Associate Administrator and led America's return to space. 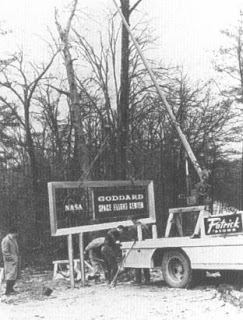 He also served as Goddard's Director from 1987 until his retirement in 1990. Townsend was profiled in an interview in the June, 2008, issue of CQ. The FCC seems to have embarked on a fishing expedition in its "first request for production of documents" as part of its enforcement proceeding against controversial ham Glenn Baxter, K1MAN. Baxter is accused of operating his station without a control operator present, of transmitting material of a commercial nature and other violations of amateur rules. In its "first request," the FCC asks Baxter to submit, among other things, all documents that he has previously sent to, or received from, the FCC (one would think the FCC already had this material in its files - ed. ); all published or unpublished documents - including drawings, cartoons and photographs, relating to amateur radio, the FCC, its staff or rules; and any documents "relating to any amateur radio transmission for which Baxter received or was promised, directly or indirectly, valuable consideration." (Apparently, the FCC is unfamiliar with the Constitution's prohibitions on unreasonable search and seizure -- no judge would authorize a search warrant for such a broad and vague collection of material -- and on compelling one to incriminate oneself. -- ed.) Baxter's reply was that the FCC would be the best place to find FCC documents, referred the FCC attorney to material on his website for some of the material, and for others, that "applicant does not have any such documents."